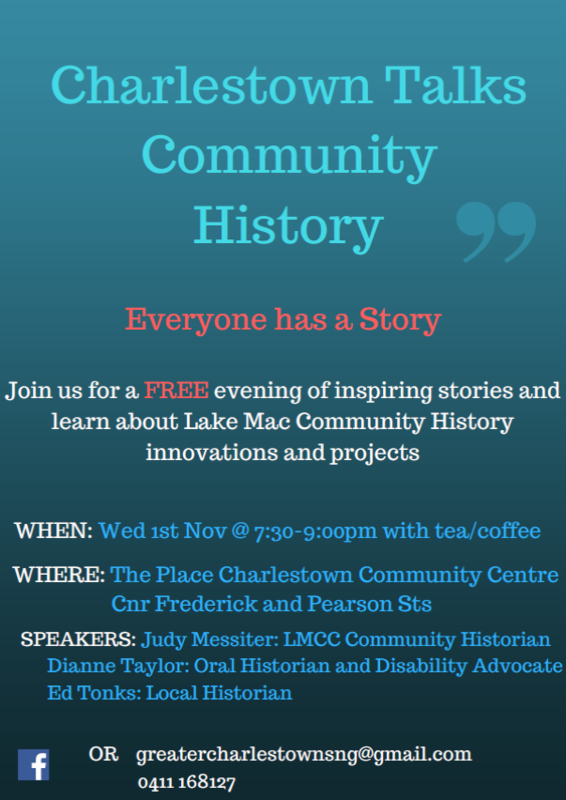 Join us for a free evening of inspiring stories and learn about Lake Mac Community History innovations and projects. Accessibility. The Place is accessible for wheelchairs, prams and trolleys. For details of accessible paths from the carpark, visit The Place website. For more information, contact the Greater Charlestown Sustainable Neighbourhood Group on 0411 168 127 or greatercharlestownsng@gmail.com. Stay tuned for the next talk in our series. Keep up to date by liking our facebook page: www.facebook.com/greatercharlestownsng.